Millions of women have loved the miraculous work of the Avon Anew Genics Night Cream. 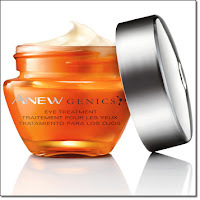 Now in Avon Brochure 7 2012 Avon is launching the Anew Genics Eye Cream. They have found the youth gene in make skin cells act younger. You too can have brighter, smoother, wrinkle-free, firmer eyes of your youth. Get your Anew Genics Eye Cream soon! How to Use Anew Genics Eye Cream: Use AM and PM in the place of your normal eye cream.